Keeping D healthy has and always will be a priority. We've never really had any issues with D's health, I mean he catches colds and bugs that are around and he seems to be prone to getting tonsillitis but generally he's healthy. 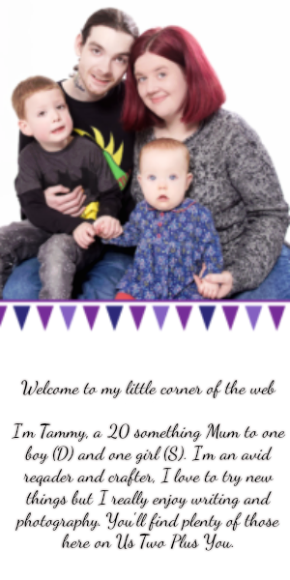 Now that D is going to start nursery in September I have been thinking about how we may need to give his body a boost of nutrients. We have tried vitamin supplements before to no avail, he will always find something he doesn't like about them. I usually find the when we give D supplements I will be very careful about what he can then eat or drink as they tend to contain high percentages of the daily recommend amount for the nutrients included. In the end we always stop, D either hates them or I hate them and we end up back at square one. When I was reading the email about Nurture Fruity Water+ I thought it would be the perfect drink for D and other children who could benefit from that immunity boost! Nurture Fruity Water+ came to be when parents of three children, Lucie and Derek Sanders made it their mission to create a children's drink that not only tasted good but was healthy. They have the firm belief that if children consume less sugar from an early age then they will be less inclined to make unhealthy decisions later on in life. This would also make them less inclined to develop a 'sweet tooth'. Nurture Fruity Water + is an alternative to juice and water for children over the age of one. It is the first functional drink of it's kind in the UK which contains added nutrients as well as containing lower naturally occurring sugar. Nurture Fruity Water+ does still contain some sugar however the naturally occurring sugar only amounts to less than one teaspoon per 100ml. This makes it exempt from the upcoming sugar tax which will issued in the UK! Nurture Fruity Water+ also meets the governments guidelines for school's standards in England meaning that it is acceptable in schools as a healthy drink and alternative to water. Unlike many vitamin supplements you will find only 20% of the daily recommended amount in each pouch of Nurture Fruity Water+ which for me allows me to relax and know that D is getting an added nutrient boost without me having to worry if he's getting too much. Inside each pouch are the nutrients which support the normal function of the immune system along with supporting the growth of bones and teeth. I have never found an ingredient list I love more than the one for Nurture Fruity Water+, reading ingredient lists usually end in me googling at least one ingredient to find out what it is. With Nurture Fruity Water+ I know every ingredient and more importantly I know why it is there! 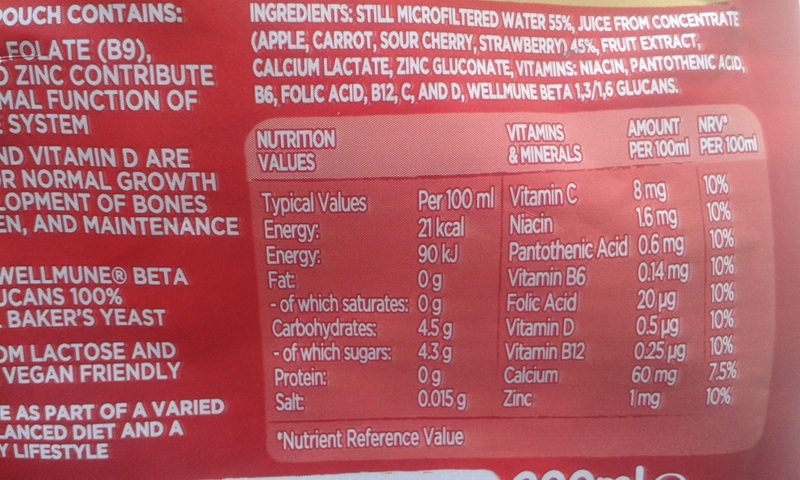 As you can see above the ingredient list is as follows: Still microfiltered water 55%, juice from concentrate (Apple, Carrot, Sour Cherry, Strawberry), 45%, Fruit extract, calcium lactate, zinc gluconate, vitamins: Nicin, pantothenic acid, B6, folic acid, B12, C, and D, wellmune beta1,3/1,6 glucans. That is all there is inside the drink, no additives or no preservatives and it is free from Gluten and lactose. Nuture Fruity water+ is also suitable for Vegans. Nurture Fruity Water+ is perfect for taking with you while you are on the go. The pouch is perfectly sized to fit in small areas including being the exact size to fit in D's backpack/ harness which he uses to hold toys or special treats when we are out for the day. The pouch would also fit inside handbags, changing bags and pretty much any bag you can think of without taking up much space! The pouch also has an anti spill feature inside the opening of the pouch. With this feature there is no mess to clean up if the pouch is dropped or falls off the table. It also means that you can rest assured that the pouch will not leak inside your bag or spill all over your child while in a moving vehicle. As you can see in the image above there is no leakage when the pouch is held upside down, in fact the only way to get the Nurture Fruity Water+ out of the pouch is to either drink it or to squeeze the pouch(pretty hard I might add). I did find that D wouldn't get all the liquid out of the spout when he was finished drinking, there would be a small amount left which just stays there. While we are out I tend to just tip the pouch up and let the remaining liquid fall out onto a napkin or wipe (it is just a dribble). Nurture Fruity Water+ comes in two flavours. D has really taken a liking to it, he loves the cherry and strawberry flavour which he immediately loved. He does also like the orange and pineapple flavour, this one wasn't a hit right away and he didn't like the flavour the first time he took a sip. However after a few tastes he seemed to have changed his mind. I feel confident in saying that Nurture Fruity Water+ will become a regular drink in D's diet and that we will continue buying the pouches regularly. I was happy with the knowledge that D is getting a top up of his nutrients and is enjoying Nurture Fruity Water+ making it an all round winner for us. You can also try Nurture Fruity Water+ for yourself as we have some to giveaway! 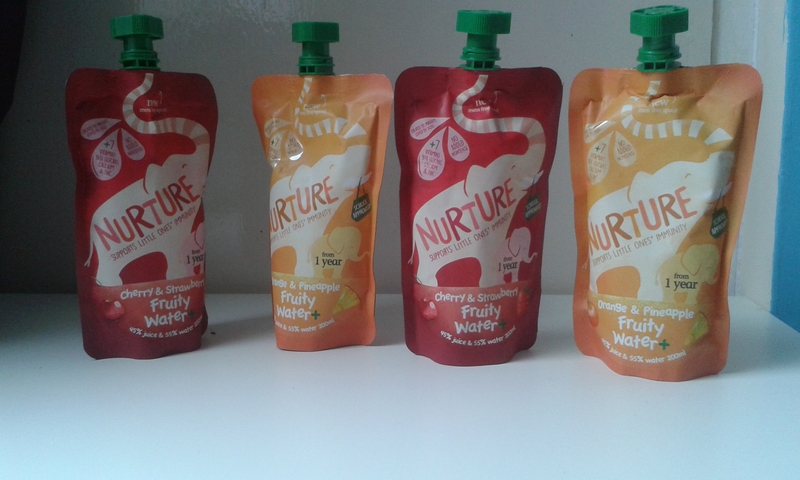 You can enter our giveaway below where five readers will win 2 pouches of Nurture Fruity Water+ (one of each flavour). To enter follow the steps in the Gleam widget below. Enter using the Gleam.io widget by logging in and choosing any entry routes you would like to complete. Each entry route will gain one entry into the giveaway. There are daily entry options. The winners will be informed by email within 14 days of the closing date, and must respond within 28 days to claim their prize. Five winners will receive 2 pouches of Nurture Fruity Water+ in both flavours (1x Cherry & Strawberry, 1x Orange and Pineapple). Nurture Immunity is the sponsor of this giveaway and is responsible for prize fulfilment. Disclaimer: We received the pouches of Nurture Fruity Water+ in return for an open and honest review. All thoughts and opinions expressed above are my own.